Schaller’s iconic bust of Beethoven was given to the RPS (then the Philharmonic Society) in 1870 by Fanny Linzbauer in recognition of its generosity towards Beethoven in times of need. It was displayed on the concert platform of every Society concert thereafter; a tradition which was re-established this year as part of the RPS Bicentenary celebrations. Beethoven Bust, it’s been quite a year. It has indeed. It’s incredible to think all the way back to our launch party with Alfred Brendel at the Argyll Arms pub. 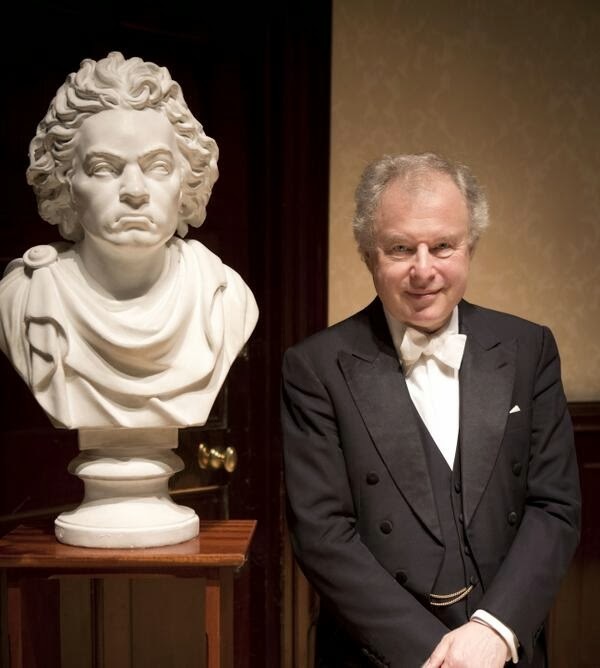 We recently rounded off the Bicentenary celebrations at Wigmore Hall with another world-renowned pianist; on 21 December the RPS Gold Medal was awarded to András Schiff after his 60th Birthday Recital. I’m so glad that the presentation is available to watch online. I think the cameraman caught me from my good side! It sounds like quite a night. I hope you’ve been enjoying a well-earned break over Christmas. Yes, I even got a Christmas present! The RPS gave me a bag of chocolate coins. I think they were alluding to the fifty pounds they gave me back in 1822 to commission my Ninth Symphony. I’ve increased my rates since then, though. We won’t expect a new piece from you any time soon. What have been your highlights from the Bicentenary year? That’s a very tricky question! Hearing so many new commissions, both by established composers and from younger composers at the start of their career has been really inspiring. 22 composers were commissioned by the RPS to write new pieces in 2013; the most in any year since I’ve been around! 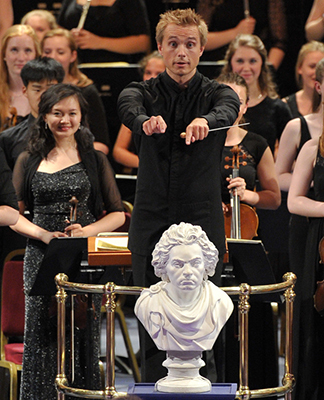 The BBC Prom in August with the fantastic National Youth Orchestra and National Youth Choir of Great Britain was definitely a stand-out moment for me. Could that have anything to do with the fact they were performing your Ninth Symphony? Well, it does seem to have aged well (just like me). But Frieze, an RPS co-commission from Mark-Anthony Turnage which they performed first, had me spellbound. And the same programme travelled to New York in the Autumn for sell-out performances by the New York Philharmonic Orchestra? So I hear! Sadly I didn’t make it across the Atlantic as well – my passport’s a century or two out of date. I have been appearing at RPS concerts and events all around the UK though – Manchester, Poole, Birmingham… It’s like the old days between 1871 and the last RPS concert series in the 1980s, when I always stood on the concert platform. Fantastic! So over time you’ve become a much-loved icon of musical excellence and support for the living composer – two causes at the heart of the work and ethos of the RPS. Sounds about right – and I’m back by popular demand. But the RPS Bicentenary year is coming to an end. Does this mean you’ll be retiring from public life again now? I may take things a little slower, but I’ll be making the odd guest appearance. Besides, I still have my Twitter feed @beethoven_bust to manage!